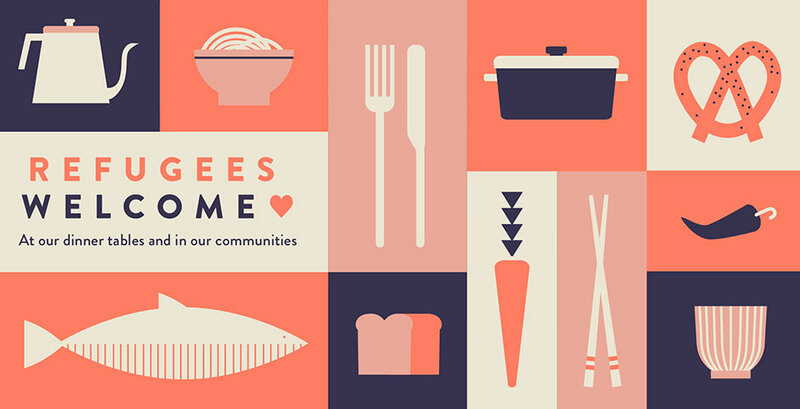 "Refugees Welcome is a dinner series designed to bring refugees and non-refugees around a table to break bread and break barriers." "Right now, an unprecedented 68.5 million people have been forced from home. Many of those folks are coming to countries in North America and Europe and need to make new ties and find new communities. We thought bringing people together over a relaxing, fun meal could help build those new relationships." "We launched on Valentine’s Day 2017 in the hope that the day could not only be a day of romantic love, but of love for your neighbour and love for community. In a time of rising xenophobia and insularity we hoped the dinners could help break down misconceptions about our new neighbours and show them they are welcome in their new home countries. We thought the series would only last a month, tops, but the reaction from hosts was super energised and with more and more hosts signing up in our second year, we've now directly organised more than 115 dinners in five countries, and we’re still growing." "The breakthrough moment was realising that corporations really loved this idea and not for any standard notion of ROI. The launch of the series coincided with the advent of the travel ban in the United States and corporations were eager to sign on to the program as a way of demonstrating their values, both externally to their consumers and users, as well as internally to their employee teams. The participation of companies ranging from tech giants to brick-and-mortar retailers helped demonstrate the depth and reach of this concept and motivated us to keep accepting offers to host well past our initial timeline for our involvement." "Yes. While our series is principally based on the human to human interactions that happen over a meal, social media was a great way to show others what dinners look like and to inspire them to host some of their own. We also used our web platform to share online toolkits that can help guide hosts on the steps needed to host dinners and best practices." "Our biggest challenge was to convince refugee resettlement agencies and asylum-seeker support groups to collaborate with us in bringing guests to our events. These groups are inundated with requests by well-intentioned folks seeking to help newcomers, and while the enthusiasm is wonderful, requests can be difficult to manage for understaffed, under-resourced agencies. After agency representatives attended our dinners they saw that our program was well-organised, wouldn’t put any additional burden on them, and that the refugee guests in their network wanted to keep attending dinners. Since that initial outreach the program has just really built on itself through word-of-mouth." "That organisations who hosted dinners would be so moved by the events that they'd want to go way beyond dinner in building relationships and providing tangible outcomes like jobs, internships and investment in the newcomers who attend. Some of these organisations are now hosting dinners, on their own, on a quarterly, or even monthly basis, and that really speaks to the power of the model and people's enthusiasm to keep building on those ties." In a time of rising xenophobia and insularity we hoped the dinners could help break down misconceptions about our new neighbours and show them they are welcome in their new home countries.